Are you a vegetarian? Or feeling in a “veggie” mood? Then this simple and tasty meal is a variation on my “Yummy Chunky Chilli” dish – minus the meat! Put the cumin seeds in a large saucepan and toast for about 3-5 minutes on a low heat. Dawn: You’ll know the cumin is toasted as the seeds begin to release their ‘woody’ aroma. Mmm…delicious! Next, add the paprika and a splash of warm water to prevent the spices from sticking to the saucepan. Add the onion and cook gently for about 5 minutes, adding extra warm water as required to stop the ingredients from sticking to the saucepan. Add the sliced red peppers and chopped tomatoes. Dawn: You can roast the red peppers before adding them and this will lend a mild roasted flavour to the dish. I’ve not done this on this occasion as I was short of time but it’s worth doing as it adds another dimension to the depth of flavours achieved in the cooking. 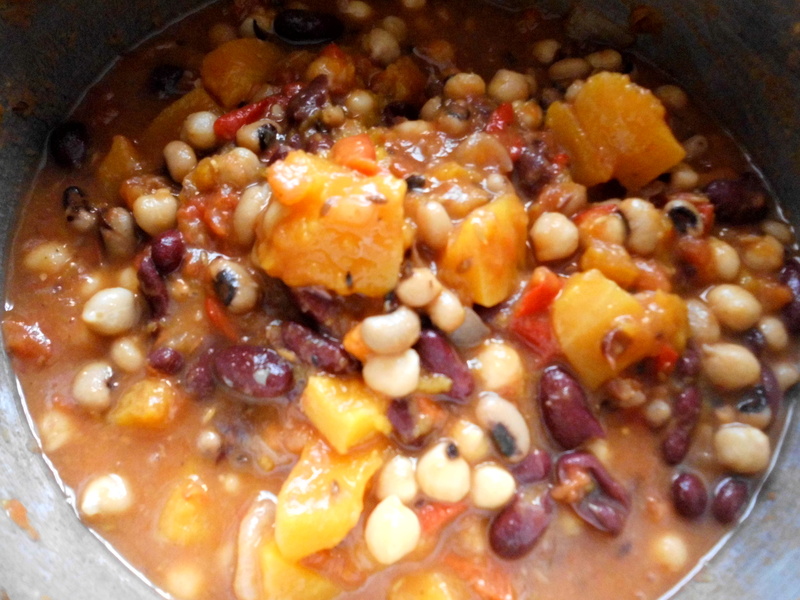 The vegetable stock and three types of beans are poured into the saucepan and mixed together. Next add the cubed butternut squash and stir the ingredients together. On a medium heat, cook these until they have reached boiling point and then lower the heat, cover and allow to cook on a low and gentle heat for about 45-60 minutes until all the ingredients are tender. Dawn: You’ll know the dish is cooked when the butternut squash becomes ‘mellow-looking’ – soft and mushy – around the edges and the stock is thick and gluey-looking in appearance and texture. It’ll look like a thickish soup with lots of textures to it when it’s cooked. Serve in a warm bowl with either cooked rice – see my “How to Boil Rice” – or a green salad or simply a slice of tasty bread to lap up the juices when you’ve finished. Dawn: Voila! A glistening nest of ruby red jewels and opulent orangey gems to feast your eyes – and bellies – upon! Enjoy! For more easy to make and oh-so simple to follow recipes, then follow this blog at www.forfoodlovers.wordpress.com and over at Twitter @Love_Food_UK. The Cooking Whiz is also on Mumsnet and Facebook. Pancake Day – also known as Shrove Tuesday – is celebrated in February or March and precedes Ash Wednesday which is the start of Lent. 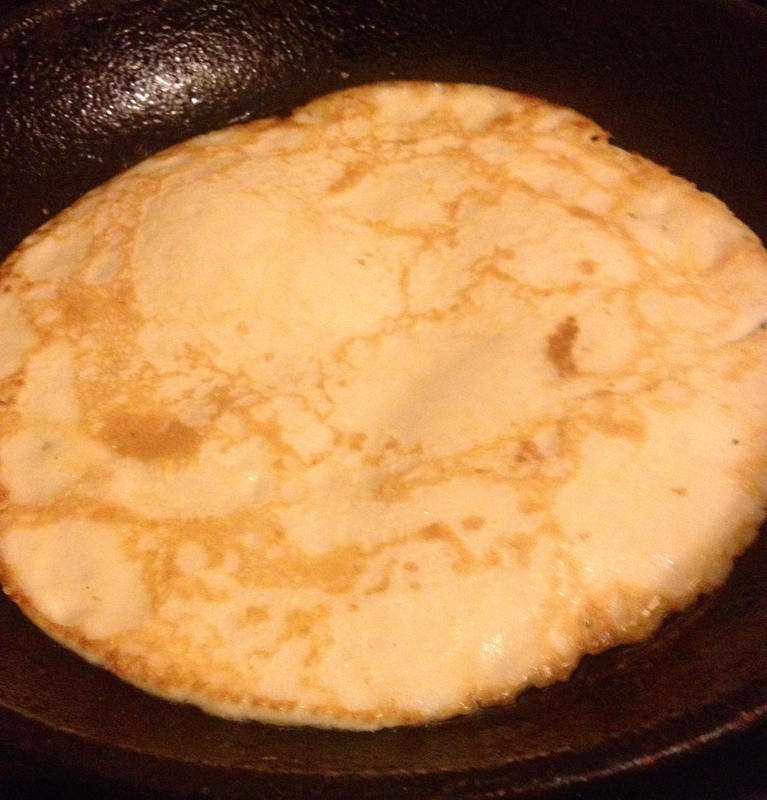 Dawn: More on the origins of Pancake Day in a bit…for now, let’s crack on with the recipe! Sift the flour and salt into a bowl. Make a well in the centre and pour the egg in, beating well with a fork or balloon whisk until the mixture resembles a thick paste in appearance without lumps. 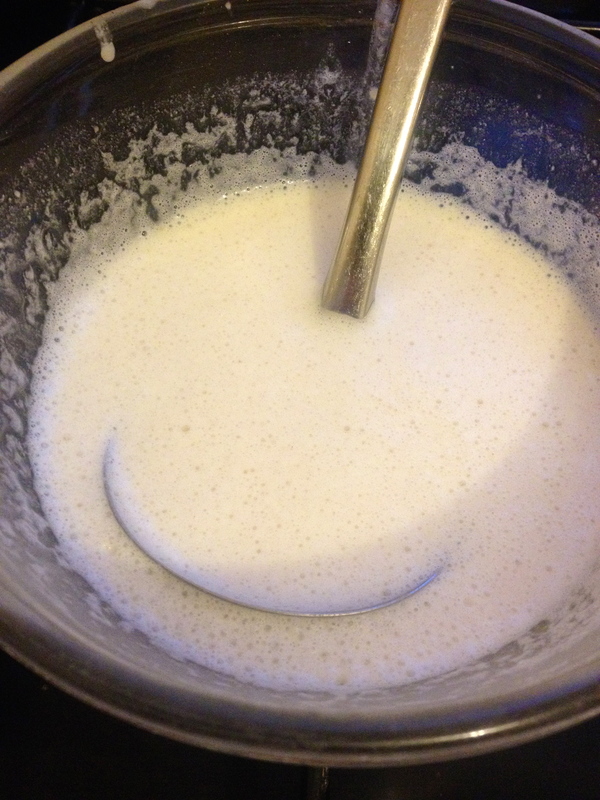 Next, gradually add the milk, mixing into the ingredients to make a smooth batter. Dawn: The batter now resembles white, frothy water and is relatively runny in appearance looking similar to a bubbling brook as it crashes against the rocky outcrops hurling itself ever forward…so it’s quite thin in consistency. But I digress! There are two main types of batter used for puddings. One is pouring batter like this one for pancakes and the other is coating batter used for fritters which is thicker for deep-frying. Heat a little of the vegetable oil in a large non-stick frying pan, running the liquid around its surface until it is very hot. Any excess oil can be drained off into a cup for use later. Pour in just enough batter to create a thin coat on the base of the frying pan, tilting the frying pan to help the batter evenly cover the base. Cook for 1-2 minutes until golden brown. Dawn: To find out if the pancake is cooked, simply take a fish slice or palette knife and lift an edge of the pancake up; if the underside has turned golden brown it’s cooked that one side. Flip with a fish slice or toss in the air and cook the other side until it too has become golden brown. Dawn: I can’t toss! I always turn my pancakes and carry on cooking them. No comments, please! Put the pancake on a plate and place a sheet of greaseproof paper on top of it, placing the plate on top of a saucepan of boiling water to help keep it warm. Repeat with the remaining batter and place a piece of greaseproof paper between each pancake. When finished making the pancakes, serve sprinkled with sugar and lemon juice. Dawn: As a variation, if you’re using fresh lemons for the juice then you may wish to grate some of the rind and add it to the batter, stirring well before cooking. The origins of Pancake Day or Shrove Tuesday is centred upon Lent and Easter. Shrove is derived from the word “shrive” which means to obtain absolution for one’s sins by way of confession and doing penance. Many Christians including Anglicans, Methodists and Roman Catholics observe self-examination including any mis-doings with a view to repenting and look at what in their lives they need to seek God’s help with. Pancake Day is usually in February or March and precedes Ash Wednesday which is the first day of Lent, being a period of forty days of fasting omissions and religious obligations that can include going without chocolate or cake, etc in recognition of a person’s sacrifice to mark their repentance. In pagan times, before the Christian era, the most important part of the Shrovetide week was the making and eating pancakes which symbolised the hot sun, bringing forth its power, light and warmth to the Slavs (European ethno-linguistic peoples living throughout Europe, North and Central Asia). The first pancake was put out for the spirits of the ancestors and on the last day, some pancakes amongst other foods were burnt as a sacrifice to the pagan gods. For more delicious cooking ideas, cheap meal ideas and food tips, follow this blog – www.forfoodlovers.wordpress.com – Twitter @Love_Food_UK we’re also on MumsNet Bloggers Network. See you over there! For a cheap and cheerful midweek supper, this risotto is an easy-to-make meal for singletons, couples and families alike. Put the chopped onion in a frying pan, adding a splash of water to prevent the onion from sticking to the pan plus a pinch of salt cooking it until soft and translucent in appearance. Dawn: A pinch of slat prevents the onion turning a brown colour while it is softening and helps show off the final appearance of this glistening jewel of a dish to its full advantage. Next, add the chopped mushrooms and sundried tomatoes with a drizzle of the oil they have come in, and cook for about 5 minutes or until the mushrooms have turned soft in texture. Wash the rice and add to the pan, stirring until it is covered in the oil. Then add a ladle at a time of the vegetable stock, continuously stirring the ingredients together until the liquid has been absorbed into the rice mixture. Add a ladle at a time until all the stock has been used and the combined ingredients look creamy in consistency. 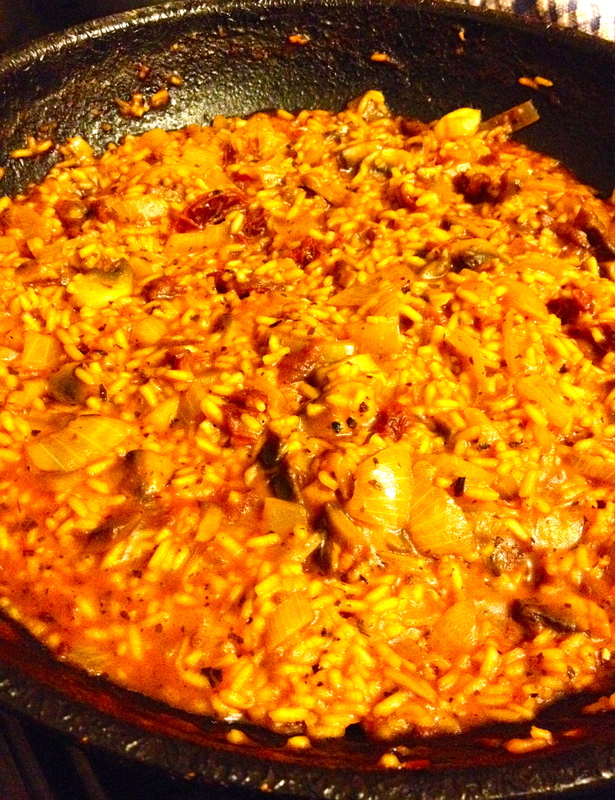 Dawn: The rice will have become plump so you’ll know it’s cooked. Serve with either warm crusty bread in warm bowls or with a mixed green leaf salad or fresh vegetables. I’ve used risotto rice here but you can use any rice that you have in your cupboards and this is a very easy, cheap and tasty supper to make. And for families of, say 4, simply double up the ingredients. Risotto originates from northern Italy and is traditionally served as a starter dish Bon appetite! For more economical and tasty food recipes, follow this blog – www.forfoodlovers.wordpress.com and scoot over to Twitter @Love_Food_UK for regular food chat as well as finding the Cooking Sensation over on Facebook (come ‘Like’, please). Oh, not forgetting the fab MumsNet Bloggers Network, too!